Anthony Davis is going to own the league sooner rather than later, because Anthony Davis is a shot-devouring, rebound-snatching, dunking monster who is now armed with a solid mid-range jumper and respectable handles. Dunks and smooth jumpers and blocks are great, but if you really want to see what makes Anthony Davis special, take a look at the GIF above. This happened during Saturday's Mavericks-Pelicans game, and it tells you everything you need to know about what a disruptive force Davis is. There he is hedging hard on a pick-and-roll a good three feet beyond the three-point line, then sprinting to the corner in time to block what should have been a wide open three. Guys that large aren't supposed to be able to do that. You may think that this play has more to do with Chandler Parsons being gun shy than it does with Davis's length and speed—he sure does look open when he first gets the ball—but watch again and notice where Davis is when Parsons pump fakes. He's still a good distance from Parsons, but he's starting to gather himself for a soaring attempt at a block. Most shot blockers aren't a threat to any shooter from that distance, and the fact that Parsons felt spooked enough to even consider pulling his shot back says a lot about the amount of fear Davis can fill a shooter with. Parsons was doomed as soon as he went for the fake. Davis has enough smarts and body control to threaten a shot block without actually leaving his feet, buying him enough time to close in on Parsons and smother the actual shot with ease. 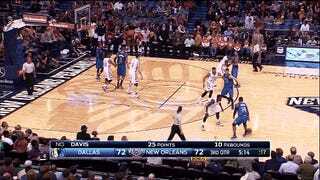 When this play started, Chandler Parsons probably though he had himself an easy three points. It ended with him laying helpless on the floor after getting his shot capped, because Anthony Davis is out here toying with motherfuckers.